Anna, Taylor, and I went to the bakery the other day in search of “the good bread.” The “good bread” is the bread that Cydney and Talbot had been talking about ever since they had arrived back from the March trip. “I went and bought it everyday because it was delicious and cheap!” That is all that Talbot talked about. I really wanted to try that bread because it sounded incredibly good. It seemed as though Taylor and Anna had the same idea as I did. Finish with school, walk to town, and buy chicken, ice cream, and that bread. We had successfully made it to town and began to walk towards what we thought was the chicken place. As we entered we all did a double take. Why is there computer and credit card equipment in here? 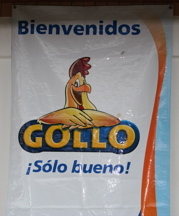 Come on, anyone would have been fooled by the big cartoon chicken logo that protruded above the store. We eventually found the store that we were searching for and entered. When we emerged, we were carrying 4 large pieces of crispy fried chicken with smiles plastered to our faces. The bread store was supposedly right up the street, so we headed out on our way to bread heaven. We entered the store and searched the wall cases. Donuts, croissants, strudels, and other beautifully scrumptious items lined the cases. “Well we can’t just get the bread….” We ended up leaving the store with pastries and what we thought was “the bread.” We sat down outside the heladeria (ice cream shop) and proceeded to feast upon our goodies. The pastries were amazingly scrumptious but the bread that we bought, strange bread with an iridescent yellow color, was disgusting. I swear, it was the worst bread that I had ever eaten. We tricked the rest of our classmates into eating it and eventually convinced Jackson to take it home with him. We still to this day have not found the good bread and I am very sad. We will find it eventually and when we do…. That will be the day.